But it’s how capitalism makes things fungible that’s interesting. And in looking into the question, we also see the relationship between capitalism and scientific ways of knowing. For the kind of thinking I want to discuss here, the main thing is to find the most basic unit. For the physical sciences, this quest for the smallest, the foundational particle has led to atoms, and then electrons and protons and neutrons, and then quarks, and now string, which may or may not exist outside the mathematical equations used to describe them. When you get all the way down there, the solidity of the fundamental particle begins to waver and break, and the very notion of “particle” becomes fraught. Perhaps there is finally no real distinction between the smallest particle and the calculation of it. Could it be the same with capitalism? At first thought, the basic unit of capital is perhaps the smallest unit of currency—say, a penny. But this is naïve: stock trades hinge on fractions of cents, and fractions can keep receding into infinity. And in any event, the principles of fungibility extend even to places where no exact currency amounts are specified. How much do you have to spend to hold your table at a Starbucks? It depends. How are you dressed? Commodity relations drift from things to people—this is old news. But how do we make sense of it? Perhaps the foundational unit of capital is not to be measured in currency but in time. Again, though, the smallest common unit of the clock can be infinitely subdivided: microsecond, nanosecond, picosecond, femtosecond. However, time subdivided is still time quantified. As with the distance traveled by the arrow in Zeno’s paradox, we can keep subdividing forever and still come up with some definite amount. The main thing is not any particular subdivision of time, but that time is subdivided. Time itself has no marks; humans superimpose the marks of the clock face upon it. The quantization of time is our invention and exists only insofar as we act as if it does. But everybody does, and this has incalculable effects on everything in our lives. In considering the foundational unit of capital and seeking the smallest unit, we are going about it the wrong way. Whether we are talking about currency or time, what is foundational is not some particular entity but the very principle of quantization—the assumption that, for a quality (money or time) to enter into reasonable discussion, it must be put on a footing whereby it can be counted on a uniform scale. Once we have determined the scale, we can assign value. Once we can assign value, we can establish a basis for exchange. The unit of measure is just a detail. The foundational unit of capital is not a unit at all but is itself the principle of exchange. The principle of exchange is the very fact of exchangeability. The idea that there are identity relations that could be set up between unlike things forms the necessary basis of exchange. Human presence is not the same kind of thing as a cup of coffee, and yet a capitalist society will seek always to find the common denominator between them, so they can both be entered into calculation. The value of your presence at Starbucks on a busy afternoon is variable, some complex and moving equation of the latte you just paid for plus your own social capital (itself indexed by dress, grooming, race, gender, the possession of a smartphone or laptop, etc.) plus the time of day (early morning rush or midmorning lull), itself given a value by a whole set of other equations derived from the start times and break times of the sum total of workers in a given area, etc., etc. Perhaps no human being could ever run all the numbers. But there is some instinctive rule-of-thumb by which we all operate and which we assume in the course of our daily lives, and the foundational understanding that vouchsafes that rule of thumb and makes it real in all our human interactions is the abiding awareness that the intangibles of human life are in fact not so intangible, that they have been (or eventually will be) figured out, quantized, assigned a value, placed on a scale. That somehow there is a value to be assigned to a human presence in any given place at any given time. That there is a value to human beings, and a value to everything that humans value. Everything is quantized. Or, more precisely (though more clumsily), everything becomes part of the regime of quantification. Imagine a scene from the libertarian utopia, that dream that is to the neoliberal state what the classless society is to Marxists. In this utopia, all schools have been privatized, market principles hold inflexible sway, and the best education can be had for top dollar. Only rich people can send their children to the best schools, but this is as it should be, as wealth is an index of hard work, innovation, and entrepreneurship. Wealth is a matter of will: poor people are poor because they have failed. But wait, says someone, we cannot blame children for their parents’ idleness and stupidity, can we? And the thoughtful libertarian scratches his head and says no, I guess we can’t, but (here he brightens a little) there is, after all, no problem that the market cannot solve. And behold, a market solution appears: sports apparel corporations are willing to tattoo children with their logos and in return will fund tuition at expensive schools. So in return for turning their children into walking billboards, poor parents can afford decent education. I doubt that, for the libertarian true believer, there is anything wrong with this arrangement. But I also doubt that most parents would happily consent to it. We feel that children have some quality that should be protected from exploitation, and however we might define “exploitation,” this thought experiment offers a pretty good example of it. But my libertarian interlocutor would spot the weakness of that last sentence right away. What do you mean by “some quality that should be protected”? Define it! Well, uh, maybe we could call it innocence . . . Then what do you mean by innocence, and how do you propose to “protect” it? And at this point our conversation might take a predictable turn. Libertarians would try to pin me down to what specific harm concerns me, and by “specific” they would mean some measurable harm. This puts me in a bind. But if I concede the positivist’s threshold assumption that there is no quality in human life we can meaningfully discuss that cannot be quantified, then I am forced to redefine a metaphysical term like “innocence” in physical terms—which is to say, redefining it to mean something that suits the terms of my interlocutor’s worldview. And this amounts to redefining it out of existence. Innocence with a dollar sign on it is not what I mean by innocence. Maybe not what you mean by it either. One of the things we want children to be innocent of is the inescapable aspect of valuation and exchange that torments their parents. Children need unconditional love and deserve to feel that the care they receive is likewise unconditional. If everything has a value, then love must as well. In the libertarian utopia, there is no unconditional anything. The tattoo I’m imagining in my thought-experiment is the ineradicable mark of the exchange of parental care for cash on the barrelhead. It is a mark of the supremacy of money over whatever it is we mean by “unconditional love and care.” This is why it is indecent. In the face of such indecency, I would have to insist: children deserve* protection from a world that demands something of them for the mere fact of their existence. They will learn the brutal truth soon enough; grant them a few years of innocence. But for me to make this argument at all, I cannot place it on the grounds of quantification. To demand that I do so is to demand that I surrender the warrant of my argument, which is that you can’t put a dollar sign on everything. This same debater’s trick — insisting that the your interlocutor’s terms be redefined in such a way as to confirm the warrant of your own argument — is played by neopositivists of all stripes. Richard Dawkins is often accused of being ignorant of the religions he attacks, and he will sometimes respond by saying that one can only be responsible for knowing facts, not lies or fairy tales, and will then ask his critics to name one fact that religion has uncovered. 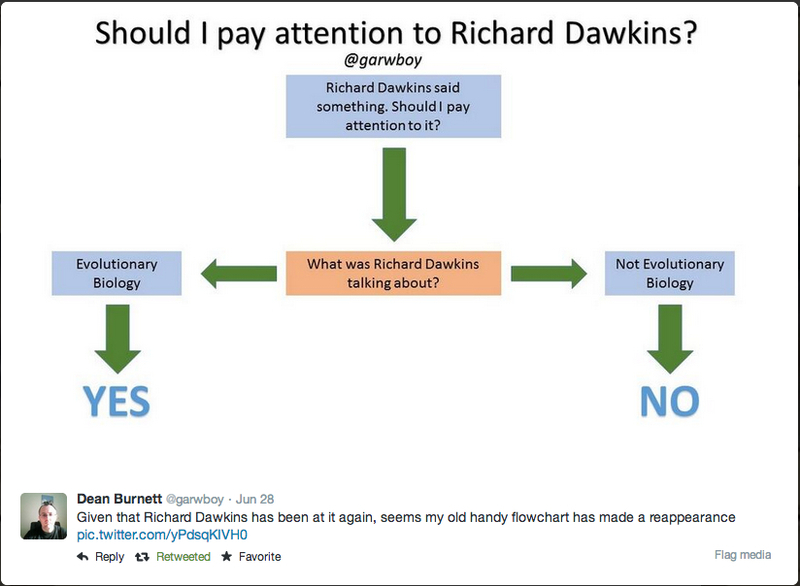 A glance at atheist Twitter feeds will confirm that this is a popular argumentative move among Dawkins’ followers, who will sometimes turn it around and ask what facts Dawkins has gotten wrong. But such arguments are misleading, because they assume that facts are all that count, and in religion they surely aren’t. It is only fundamentalism—the strange twin of neopositivism—that insists that religious knowledge lays claim to facts in the same way that science does. For that matter, while there are certainly facts regarding poetry and music, poetry and music themselves don’t concern facts, either. There are a lot of music-analytical and music-historical facts about, say, Wagner’s Ring cycle, but what facts might we learn from listening to that music? Do we learn metallurgical principles from the forging scene in Siegfried? Can the Rheinmaidens teach us to swim? Of course you would have to be an idiot to expect such a thing. Centuries ago, Jonathan Swift lampooned such excesses of scientific zeal by parodying those who complained of Homer’s factual inaccuracies: “We freely acknowledge Him to be the inventor of the Compass, of Gunpowder, and the Circulation of the Blood: but I challenge any of his admirers to show me in all his Writings, a complete account of the Spleen. Does he not also leave us wholly to seek in the Art of Political Wagering? What can be more defective and unsatisfactory than his long Dissertation upon Tea? And as to his method of salivation without mercury, so much celebrated of late, it is to my own knowledge and experience a thing very little to be relied on.”** It is ironic that neopositivists, so keen on the progress of knowledge — so insistent that the only legitimate knowledge is that which progresses — should be making the same crass blunders as their intellectual forebears from three centuries ago. Here is what’s at stake in all this. Most people think of philosophy as just another abstruse academic pursuit, or worse. Unsurprisingly, neopositivists hate and fear nonpositivist philosophy, since it can undermine their arguments in ways they cannot effectively defend. But what I want to suggest is that philosophy matters, because whether or not you know it, you have a philosophy, and it is probably making you miserable. And it is probably the very philosophy you hoped would make your life better. It is often said that the most basic problem facing the left today is the problem of hope, or rather the seeming impossibility of imagining a future that looks any different from the present. As Frederic Jameson wrote, it is easier to imagine the end of the world than to imagine the end of capitalism. The Left finds itself confined to figuring out an agenda that seems always to have been dictated within someone else’s terms and having to shrink its visions down to suit the confining worldview of some invisible master. I want to suggest that the master is a philosophy, a way of thinking, and that it is how our best friends think. Somehow we have to find a way out of this. The chains that bind us are forged in the mind, and it is in the mind that they must be broken. Karl Marx famously said that philosophers have only interpreted the world, while the point is to change it. In our own time, it seems, we will only change the world when we find a new way to interpret it. ***Well, except for the xkcd part. Some of the jokes are OK, don’t get me wrong, but for the most part this cartoon, which treats illustration as a mere delivery device for verbal content, is the best illustration I can think of for the threadbare, talky, tacky, boring aesthetic sense of contemporary geek culture. ****This is from an essay titled “Why I Am No Longer a Skeptic,” by Stephen Bonds. This essay appears to have been taken down, but you can use the Wayback Machine to find it. You are wrong about xkcd (and I’m not going to make the obvious joke). The illustrations are very good, and while I see why you say it’s a “mere delivery device”, that’s also why you don’t see it: you probably never thought the illustration style could be something more. Maybe if you looked at it longer, it might open up for you. p.s. : I guess I had to dig up something to disagree with. Gold. You continue to give no quarter to fellow-travelers, any more than you would to Death-Eaters, thus raising the bar to where it should be.